"MY GIRL" was captured by Unique Moments Photography from Gig Harbor Washington. 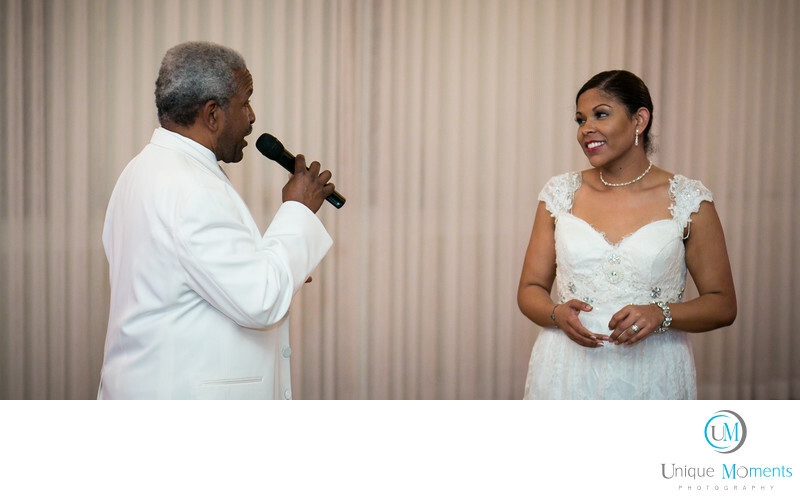 The DJ gave her father the Mic and he was going to give a congratulations speech to the bride and groom. Well we knew it was going to happen but No One else at that wedding knew what was about to occur. The brides father is a professional singer and musician. While he was speaking about the bride and groom, he stopped and said he had something he needed to say. At That point he broke into a Solo singing My Girl to his daughter that would have made all 4 chairs turn on the voice. Simply an awesome awesome moment. Its never the picture that is special about moments like this, Its always the story before the image was captured. This images is no exception and was captured well into the reception. It never would have been captured if we were not there. Another huge reason why you should hire a photographer that will be at your reception until all the important moments are completed.